Like the Beluga caviar or Kobe beef, Jamón Ibérico is the ultimate of its kind. The combined efforts of many Jamón enthusiasts culminated in the first Ibérico hams arriving on our shores in 2007. Embutidos y Jamónes Fermín was the first company to export Ibérico ham to the U.S.. This small family company invested countless hours and a significant amount of money to make their facilities ready for USDA approval. Since then, other companies have been approved, but we all owe Fermín a debt of gratitude for making this dream come true. Reserva Jamón Ibérico de Bellota Ham by Fermín :This Reserva ham by Fermín is intensely flavorful, and each slice is marbled with golden fat that literally melts in your mouth. Free range, acorn fed pork and four years of aging in the clean mountain air of La Alberca come together to create this masterpiece of flavor. The best way to experience Jamón Ibérico de Bellota is by savoring slices cut directly from the ham, when all of the flavors and textures are at their finest. The first Jamones Ibéricos (hams) arrived in time for Christmas in 2007. The first was sliced by celebrity chef José Andrés on December 12th of that year with the Spanish ambassador to the U.S. in attendance. Now many types of Ibérico ham are available, including acorn fed Jamón Ibérico de Bellota, slices, bone-in hams and boneless hams. Jamón Ibérico is the pride of Spain. The lineage of the unique animals that produce the hams stretches back to pre-history when they ran wild in the Iberian Peninsula. Columbus had some of them on the Santa María when he set out to discover the New World. Ibérico pigs, the ancient Spanish breed live one of two different lifestyles - one lives the life of a normal pig eating grain, and the other is free-range fed on acorns (bellotas) and wild plants. 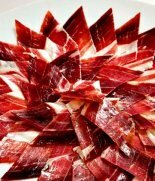 The first produces the delectable Jamón Ibérico and the acorn fed pigs produce the ultimate - Jamón Ibérico de Bellota. The only difference is in diet and exercise, but those things make all the difference in the world. The rare Jamón Ibérico de Bellota hams are infused with the flavor of their favorite food, the acorn (bellota) from a cork tree. The paper-thin slices, glistening with healthy mono-unsaturated fat, provide a rich nutty flavor and tender texture. Spaniards consume the vast majority of these hams in their own country. Some producers have waiting lists for several years for their best products. They cannot always produce enough hams to meet the demand from Spain, France, Japan and now America. From the moment they are born, the special black Ibérico hogs destined for Bellota quality are treated royally. From the time they are weaned until their 'sacrifice' (as the Spaniards term it), they live, sleep and forage under the open sky in specially maintained oak forests, called la dehesa. These rare black-hoofed descendants of native Iberian wild boar each have over five acres in which to forage and roam. They live for about two years in this porcine paradise - many times the lifespan of a normal domestic pig. In the bulking-up stage each fall, the pigs feast on 15 to 20 pounds of acorns or bellotas per day. This allows them to gain as much as 2 pounds of body weight daily! The consistent exercise they enjoy as they forage in a free-range atmosphere is essential to the final quality of the hams, because it allows the beneficial fat to be marbled into the muscles. Finally, the hams are 'sacrificed,' salted and hung to cure from two to four years. The hams are hung in drying chambers with mountain hair circulating among them, all the while carefully monitored by the Maestro de Jamón. Over time, the hams lose 20% to 40% of their weight as much of the fat melts away. Remarkably, the curing process converts much of the remaining fat into a beneficial good-cholesterol fat, much like extra virgin olive oil. This magical process only occurs in the hams made from acorn fed pigs - producing Bellota hams.